Not quite the most packed among the SteamDryer series dryers, the LG DLGX2502V is still a competitive model with its 9 drying programs and 9 options plus use of True Steam technology. With the use of steam, the dryer is able to provide intense cleaning and drying. The garments come out of the dryer smelling fresh and looking clean. 9 drying programs and 9 options are included in the LG DLGX2502Vís roster of specifications. These programs and options should be able to respond to the needs of most users. The user just needs to know how to combine the various features, options and programs to perfect the customization. True Steam technology, an LG trademark feature, help in reducing both odors and wrinkles. Without bad odors, the garments can end up smelling extra fresh and clean. With decreased wrinkles or creases, the garments will be much easier to iron. The EasyIron option further helps the consumer reduce ironing time. The user can finish freshening up the garments in only 20 minutes. If the user wants to produce extra fresh garments, he can make use of the Steam Fresh option. The option is ideal for freshening clothes that have already been washed quite awhile ago and for getting a set of clothes ready for going out. The ReduceStatic option helps in eliminating garmentsí tendency to cling when ridden with static. The option can help in making some pieces of garment easier and less annoying to wear. 7.3 cubic feet is a lot of space. It can accommodate a lot of garments. So, the consumer is able to finish his laundry in a short period of time. The graphite steel look is very attractive and modern. The owner will not be ashamed to showcase the appliance in a corner of his house where visitors may be able to wander or be invited in. The exterior is not only attractive but is also durable. 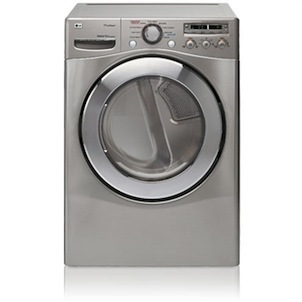 Being stackable, the LG DLGX2502V can fit into a small space together with a compatible washer. The buyer can ensure that the two appliances are compatible with each other by buying both from LG or by asking the salespersons about possible matches. There are convenience and safety features such as the child lock and the drum light. With the drum light, the user can see if there are still garments left inside. With the child lock, the dryer is secure when it is in operation to avoid any sort of accident. Steam is a good addition to the LG DLGX2502V dryer. It helps refresh and clean clothes while leaving them almost if not completely wrinkle-free. The reduction of creases is equals to the reduction of ironing time. The LG DLGX2502V is very stylish-looking. The graphite steel look provides a modern, beautiful but also durable finish to the dryer. The use of a gas dryer may not be permitted in some apartments.